I tried to sell boiled peanuts last week and we got drenched with rain. I was told that I could freeze them and use them next week. Is that correct? Yes, you can freeze boiled peanuts and reheat them later. Boiled peanuts must be stored properly prior to freezing to prevent spoilage. To prevent microbial growth, food safety requires that hot foods be stored above 140 °F, and cold foods must be stored below 40 °F. I typically cool fresh boiled peanuts in the refrigerator overnight prior to freezing them. 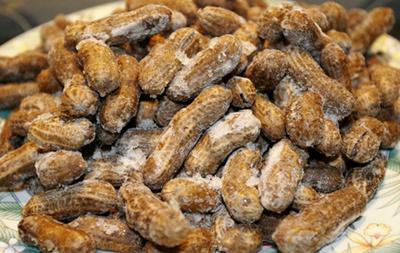 To retain the original flavor, reheat frozen boiled peanuts in water that has the same salt level as the water used for boiling them. If you used additional seasonings while boiling them, then add the same seasonings to the water when you reheat the frozen peanuts. Sample the peanuts as you reheat them to determine when they are warm enough to serve.